Continental Drift Theory’s 100’s anniversary on January 6, 2012. Pioneering scientist Alfred Wegener had presented it to the Geological Society in Frankfurt. He was ridiculed for half a century for his absurd idea that the continents float and drift. In 1945, Albert Einstein wrote a preface to a book criticizing Wegner’s theory. . In 1964, Encyclopedia Britannica stated that the continental drift theory had grave theoretical problems. unlike early scientists, modern scientists proposing radical new ideas do not need to fear the reactions of those entrenched in the existing system. 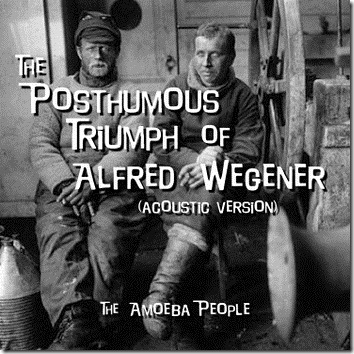 Alfred Wegener is one modern scientist amongst many that demonstrate that new ideas threaten the establishment, regardless of the century. Alfred Wegener was the scientist who championed the Continental Drift Theory through the first few decades of the twentieth century. Simply put, his hypothesis proposed that the continents had once been joined, and over time had drifted apart. The jigsaw fit that the continents make with each other can be seen by looking at any world map." "further discussion of it merely incumbers the literature and befogs the mind of fellow students. Barry Willis’s and the other scientists wishes were fulfilled. Discussion did stop in the larger scientific community and students’ minds were not befogged. The world had to wait until the 1960’s for a wide discussion of the Continental Drift Theory to be restarted. Why did Alfred Wegener’s work produce such a reaction? He was much more diplomatic in presenting his theory than Galileo. Although he believed himself to be right and that some of his arguments were compelling, he knew he would need more support to convince others. His immediate goal was to have the concept openly discussed. Wegener did not even present Continental Drift as a proven theory. These modest goals did not spare him. The fact that his work crossed disciplines exposed him to the territoriality of scientific disciplines. The authorities in the various disciplines attacked him as an interloper that did not fully grasp their own subject. More importantly however, was that even the possibility of Continental Drift was a huge threat to the established authorities in each of the disciplines.
" If we are to believe in Wegener’s hypothesis we must forget everything which has been learned in the past 70 years and start all over again." From the descriptions above it would be difficult to explain why one of the theories was quickly accepted by the scientific communities, another was quickly dismissed even as a hypothesis, and the other was accepted by some and challenged by others. Interpreting these events from a strictly scientific basis won’t help. All of the theories had some compelling advantages and all had some very serious failings when they were first presented. We might have to look beyond the world of ideas to the world of people, events and things to help answer the question. “All truth passes through three stages. First, it is ridiculed. Second, it is violently opposed. Third, it is accepted as being self-evident.” This summary, usually attributed to German philosopher Arthur Schopenhauer, seem especially true of scientific knowledge. Take plate tectonics. The idea that surface of the earth is constantly changing as continents drift around on top of a layer of molten rock is so well established that it’s hard for most people to imagine otherwise. But exactly 100 years ago today, when a 31-year-old German meteorologist named Alfred Wegener presented this idea at a meeting of the Geological Association in Frankfurt, he was mocked. It would take decades and the work of many other scientists – including some prominent Canadians – to show that plate tectonics are as real as gravity and evolution.